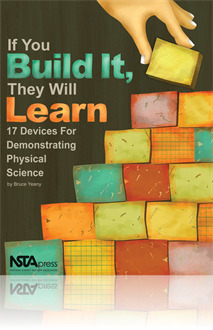 If You Build It, They Will Learn is the perfect do-it-yourself guide for physics teachers who want custom-made demonstration projects to use in their classrooms. Devices like Galileo’s Track, Coupled Pendulum, and Gum-Wrapper Thermostat will help you teach forces, energy, properties of matter, and much more. Best of all, you don’t need an engineering degree to assemble these devices. The book provides such detailed instructions that even novices can handle the necessary tasks and tools. 1. Step-by-step directions for producing 17 well-designed pieces of equipment that author Bruce Yeany has tested in his own classroom. Each set of instructions is illustrated with clear photos or drawings and includes a materials list. 2. Suggestions for how to teach with each piece of equipment. Yeany provides information to prepare students for the demonstration, ideas for the presentation itself, and interactive questions to verify that students are learning the physics concepts. When you can’t find or afford high-quality equipment from a catalog… or wish you could make your gear bigger or smaller… or simply find it satisfying to use devices you’ve put together yourself, If You Build It has your solution. Developing your own demonstrations can even enrich your understanding of the physics concepts you wish to teach. The experience creates an environment rich in opportunities for observing and investigating. Teach physics your way with custom-made demos.